Procrustes, son of Poseidon from Greek Mythology, was an iron smith and inn keeper. He offered hospitality to strangers passing his place on the road between Athens and Eleusis…for a price. Procrustes had a special bed that he offered to wayfarers. It was made of iron, and he liked to brag that the length of the bed was always an exact match for anyone who laid down upon it. Procrustes’ bed was the Sleep Number Bed of its day – adjustable to fit all sleepers’ needs. Here’s the trick: Procrustes didn’t adjust the bed; he adjusted the sleeper. If a person was too short for the bed, then Procrustes would place him on a rack and stretch him until he fit. And if the person was too tall for the bed, then Procrustes would cut her down to size…literally. Off with her legs until she fit. And, of course, Procrustes was off with the dead travelers purse. The story of Procrustes is in many ways the antitheses of the story of Pentecost. Both stories are about differences. Yet Procrustes fits different people to them same mold while the Spirit of Pentecost embraces differences between people, celebrates diversity, and proclaims unity through diversity. In spite of differences in language and culture, Pentecost is a story where folks miraculously understand one another as if hearing in their own language. It is story that celebrates the multitude of many people and many gifts united in and through the same spirit, God’s spirit. We typically think of Pentecost as the birthday of the church. Yet Pentecost is not simply a birthday party. On Pentecost, we are reminded that we must again become the church. And if we are to become the church again, then we must first understand what keeps us from being the church now. the phrase ‘captivity of the church’ points to the danger of the church being defined by an influence other than scriptures. Defined by an influence other than scripture. We are held captive by differences. We are held captive by differences that scripture says do not exist in the kingdom of God (remember: there is neither Jew nor Greek, slave nor free, male nor female). Yet these differences do exist here in our world and when fail to embrace them, when we fail to understand understand them, when we fail to give a place to each of them, when we fail to allow each to lead, when we fail to live within the midst of our differences, then we fail to become the church….we fail God. I’m going to share a story about differences. Some of you will hear this story and think I am trying to be political. Well, I can tell you for certain that I am not being partisan. And if I am being political, then I am being so with respect to the church, not our nation. You may hear this story and immediately think of issues being debated today within the halls of congress and the White House. While that may be natural for you, I want to encourage you to think about this story in relation to the church, not our national policy or leaders. I will not discourage you from reflecting on implications of this message on national politics…but please do that in the week and months to come, not in this moment. This moment is about our identity as the body of Christ. You see here at Hood we have a mission statement that speaks of supporting one another and embodying God’s love and grace for all. This story speaks of some folks included in that word ALL…folks that we have to consider a part of the church. So, Let’s look today at what makes us the church…who that us is, and what it takes to make us possible. This story is not my story. It is a story written by Rev. Amy Butler, pastor of the famous Riverside church in New York. A few years ago in my church in Washington, DC, we were facing some serious issues of conflict, broken relationship, and an inability to understand one another around the issue of immigration. We were together trying to cultivate diverse community in a city with the largest concentration of undocumented immigrants from El Salvador, together with federal employees who were tasked with the enforcement of severe immigration laws, including routine detention and deportation. In our church, many of these people sat in worship together at 11 o’clock every Sunday, but as issues around immigration enforcement and reform began to escalate nationally, it was clear that tensions outside our walls were increasingly making their way into the life of our faith community. What could we do? There were relationships on the verge of fracturing, programs we’d worked for together poised to fail, the health of our community on the line. And so, with some prayer and thought, wise leaders in our community began organizing conversations. There were little house meetings all over the city, where eight to ten people from diverse backgrounds would agree to hear one another’s stories over a meal on an evening together. Just one evening, just a small group of people. The mother in the family from El Salvador began to talk about her life there, why she and her husband—both college-educated teachers—decided to risk everything to bring their two children, then three and eleven, across the border to the United States, where they might have a shot at avoiding the violence and gang culture in which they were immersed in their rural village, where they all might have a chance at a different future. She talked haltingly and with tears, while her now nineteen-year-old elder son translated, about saving and saving and scraping together the money it would take to hire a coyote (a guide) to get them across the Colorado River into Texas, where they would try to make it to their families. They traveled through treacherous terrain, threats of the violence they were trying to leave behind dogging them at every step; pushing their young children to walk endlessly in the heat; running out of water and food; being taken advantage of at every opportunity, until finally they arrived at the river and got ready to cross. She spoke then about the fear—dread, really—of navigating the rushing current. They were holding onto a rope, she said, one by one, following the guide through the river. Her husband was up ahead of her, leading their eleven-year-old. She was toward the rear, with the three-year-old strapped to her back. Suddenly, about halfway across, he slipped off. Her baby slipped off and the current caught him and pulled him away, out of her grasp, under the rushing water. By this time in her story, the entire room was silent. Her son, who was translating, could only speak in a halting whisper, too choked up with the memory. Her husband sat in silence, his head in his hands. She continued: she let go of the rope and went after her baby, of course. Diving under the water she managed to grab a pant leg and desperately, with all her strength, pull him back to her. Together they came up gasping, the baby crying, the current pulling them away from the rest of the family. In the end, they made it across. And they made it through many other harrowing experiences to the safety of family in the DC area, where they began to build a life from scratch. Both parents work as hourly laborers, their children now nineteen and eleven. It was a stunning story, but the most stunning thing of all is that this was no anonymous recounting. We were all in tears with the power of their story and realized that right there, on the couch across the room from us, sat people with whom we worshiped every Sunday. And to think that eleven-year-old David, who brightens up the Sunday school every single week, loves to sing in the children’s choir, and hugs me at the door after worship on Sundays, could have been lost—these are people we love! I think we all got to a common ground that night, though we were by all appearances so very different from one another. We managed to move across the divide of misunderstanding and pain to suddenly realize that the gift of those relationships is so deeply worth the pain of learning to understand each other. This is the hard work of the beloved community. When we do that hard, hard work of living in relationship, in community, in church with people we love, we find we can stand in the divide of policy, opinion, and political persuasion, and somehow, some way, we can bridge a gap that seemed totally unbridgeable before. This is beloved community. This is the kin-dom of God. This is what the world needs. This is the church. This is the church when it moves from being held captive to becoming captivating: learning to understand one another, embracing the journey of the other person, opening space within our church for those who are different to partake of communion, to join children’s classes, to sing their culture’s songs, to speak their own language, to share their stories, to worship God in their way and to join with you in worshiping God your way. These are marks of a church that is not held captive by difference but captivating because of difference. Think about our church: Is their space here for you? Is there space here for someone different than you, not just to come here and do what you do, but to come here and bring what they do to enrich us all? What if everybody truly felt welcome because despite differences of opinion and expression, all could find something we liked and felt comfortable with and at the same time we can enjoy the experience of trying out that which someone else enjoys? What if every different person were one spoke of a wagon wheel held together by the hub which is the Holy Spirit? Perhaps we would find that together we can move the cart whereas alone we are not much more than a spoke that gets stuck in the ground. The wheel doesn’t turn with only one spoke. And if a spoke breaks, so does the wheel. If a spoke is missing, the wheel gives way under the weight of the cart. It takes every individual spoke – no matter what shape, what color or what wood they are made of – to make the wheel work. Can we here at Hood MCC put together this wagon wheel? Can we find the different spokes we need to make a complete wheel? Will we allow the Holy Spirit to bring us together and make us spin? We will have to listen if we are to be put together on the same wheel. We will have to learn how to coexist on the same wheel. We will have to work together. We will have to accept both spokes who are on the left and on the right. We will have to embrace spokes that have made it to the top and those who are on the bottom. Each of us will have to both follow some spokes and lead other spokes as the wheel of our community turns. But if we do all this, we will show the world that our the church is not like Procrustes…trying to stretch and shorten everyone to fit one particular expression of Christian faith. But rather the church is a Pentecost church in the truest sense of the word. 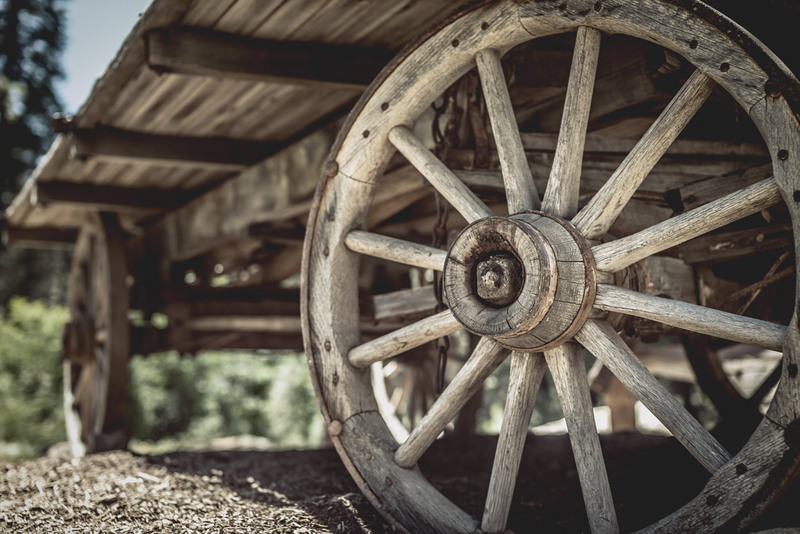 A church about creating space for many different spokes to be placed upon the same wheel that is God’s wheel so that the Holy Spirit might make us one and move the cart of our society ever closer towards the kingdom of God.